What's New for the 2018 Hyundai Kona? 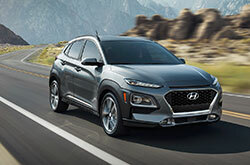 Totally new for the current model year, the 2018 Hyundai Kona is a subcompact crossover that is sized to put fun back into city driving. Its tight aerodynamic body benefits from available All-Wheel Drive that maximizes traction and the multi-link rear suspension that improves handling. Among its high-tech features is the available Blue Link® Connected Car Service. Download the app to your smartphone and you can remotely start the car to engage climate control, monitor vehicle health, or ask for help during emergencies. Your hands can stay on the wheel when you adjust radio volume using the audio controls that are mounted on the steering wheel. SE: Five-people can relax on cloth seating surfaces with the driver getting 6-way adjustments. The 60/40 split-folding rear seat allows for more flexible carrying capacity while the dual-level cargo floor encourages better organization for what you're carrying. The display audio system comes with a 7-inch color touchscreen and integrates your compatible smartphone using hands-free connectivity, Apple CarPlay™, and Android Auto™. SEL: To make cold-weather drives more comfortable, this trim adds an external temperature display and builds three-step heating into the front seats. You get more entertainment from HD Radio™ and over 150 channels that are included in SiriusXM® Satellite Radio. Leather wraps around the steering wheel and the shift knob. Limited: Leather upholsters both rows including the 8-way power-adjustable driver seat with power lumbar support. Set your air-conditioner or heater level only once and automatic temperature control maintains it under all weather conditions. LEDs improve both the brightness and responsiveness of the headlights and tail lights. Ultimate: An 8-inch color touchscreen with navigation crowns the infotainment system. To enhance the sound of the Infinity® premium audio system with Clari-Fi™ Music Restoration Technology, an external amp relies on 8 speakers that include a subwoofer. 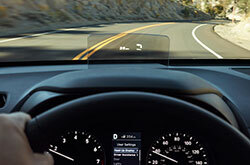 The Heads-Up Display keeps your eyes on the road by projecting such vital information as speed, cruise control, and navigation on a transparent panel positioned in front of you. On the SE trim, the 2.0-liter inline 4-cylinder features Dual Overhead Cams, 16 valves, and Dual Continuously Variable Valve Timing to generate 147 horsepower and 132 lb.-ft. of torque. This Front-Wheel Drive uses its 6-speed automatic transmission with SHIFTRONIC® to get up to 33 MPG on the highway and 27 MPG in the city. 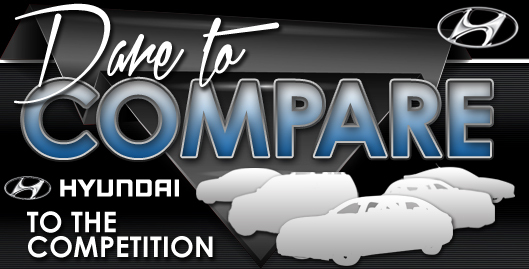 In the Limited, the 1.6-liter inline 4-cylinder is turbo-charged to generate 175 horsepower and 195 lb.-ft. of torque. Through the 7-speed EcoShift® Dual Clutch Transmission, the EPA-estimated fuel efficiency reaches 32 MPG on the highway and 29 MPG in the city. The Rearview Monitor reveals the view behind you when you pull into reverse with parking guidance to help you back into and out of tight spots. Driver Attention Warning constantly monitors your driving through such factors as vehicle position in the traffic lane, steering torque and steering angle to determine if you're tired or distracted. It then alerts you with audio-visual indicators. 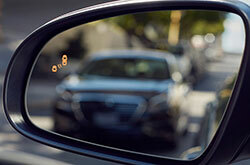 Blind-Spot Collision Warning tells you if a vehicle has entered your blind zone to make lane changes safer. When you go into reverse, Rear Cross-traffic Collision Warning alerts you to any vehicles that cross your backward path. Lane Keeping Assist engages when you meander out of your lane by applying steering assistance to put you back in line. High-Beam Assist automatically switches your headlights from high beams to low beams when it detects the lights of oncoming traffic.